Comm Eye Health Vol. 14 No. 40 2001 pp 57 - 58. Published online 01 December 2001. The insertion of an intraocular lens (IOL) is a routine part of cataract surgery in adults, even in many developing countries. It is now over fifty years since the first IOL was implanted. However, until recently, IOLs were not widely used in children. As evidence for the long-term safety of IOLs in adults accumulates, there is a growing willingness to use IOLs in children. Provided the zonule is stable and the eye is not inflamed, IOL implantation is already routine in children over five years old, and increasingly in children between two and five years. The use of IOLs in children under two years remains very controversial. One reason for this is that the eye changes very rapidly in young children. In a three month old baby, an IOL power of 28-30D may be required for emmetropia. However, this will lead to significant myopia in later life. Unlike a spectacle lens or contact lens, it is not simple to change the power of an IOL. Secondly, the diameter of the lens in an infant is 2mm less than an adult lens. This makes it difficult to implant a standard adult IOL into the capsular bag. The maximum diameter of the IOL should not exceed 12 mm. Smaller IOLs designed for use in children can be obtained. The lens should be placed in the capsular bag to reduce intraocular inflammation and the risk of complications such as aphakic glaucoma. Fibrinous uveitis. A major problem with implantation of IOLs in children is the increased inflammatory response, particularly in heavily pigmented eyes. A fibrinous uveitis is often seen about 3-7 days after surgery. This may be controlled by intensive topical steroids (hourly Gutt. prednisolone 1%), or by orbital floor, steroid depot injections. In a developing country, it is probably sensible to keep the child in hospital for a week after surgery to ensure early detection and treatment of uveitis. The risks of steroids should be considered. Despite steroid treatment, some children will develop a dense fibrous membrane, which may require surgical removal. Astigmatism and residual refractive error. While an IOL corrects the aphakia, it does not correct astigmatism, and there will almost certainly be some residual spherical error. This means that spectacles will still be necessary to achieve the best possible vision. These spectacles will be lighter, and easier to wear than the thick lenses required for spectacle correction of aphakia. As they are relatively low powered lenses, there are fewer optical aberrations. It is important that the parents – and the medical and nursing staff – realise that insertion of an IOL does not mean that glasses will not be required. We recommend that children should be refracted within a month of IOL implantation. Thereafter, children should be refracted every four months until they are two years old, and then every six months. If there is any amblyopia, it may be wise to refract even more often. Refraction must be carried out by someone who is skilled at accurate retinoscopy. In young children, the glasses should leave the child slightly myopic (approx. -1.0D) as this will give them a good depth of field, and most things and people they want to look at will be within one or two metres. As the child gets older, and starts to read small print, an additional reading correction will be required. Unsuitable eyes. Some eyes are unsuitable for IOL insertion. For example, microphthalmic eyes may be too small to receive an IOL. It is inadvisable to insert an IOL if the corneal diameter is less than 9mm. Eyes with chronic uveitis – associated with juvenile rheumatoid arthritis and rubella syndrome, for example – should never have an IOL, as the presence of an IOL may worsen the intraocular inflammation. If the surgery is difficult, and it appears that it may be impossible to implant an IOL without damaging the corneal endothelium, it is better to leave the child aphakic with an intact cornea rather than risk later corneal decompensation. The major advantage of an IOL is that it provides permanent continuous correction of the aphakia. This may be important in preventing amblyopia, and encouraging normal visual development. Although glasses are necessary to obtain the best vision, uncorrected pseudophakic vision is probably better than uncorrected aphakic vision. Which lens should be used? Many different materials and designs of intraocular lens (IOL) are available. Although anterior chamber lenses have been shown to be safe and effective in adults, there is no evidence confirming their safety in children. It is recommended that anterior chamber lenses should not be used in children at this time. Polymethyl methacrylate (PMMA) has been the material of choice for all IOLs until recently. Coating the PMMA lens with heparin greatly reduces intraocular inflammation and fibrin formation. If coated lenses are not available, intra-operative addition of heparin to the infusion fluid may be beneficial. There are now silicon IOLs, hydrophilic acrylic IOLs, and hydrogel IOLs. Some of these new materials may have specific advantages in children, particularly increased bio-compatibility, and a reduced risk of uveitis. However, this has not yet been proven. Before inserting an IOL made of a newer material, consider that it may need to last for 60 years, and we have barely ten years experience of most of the newer IOL materials compared to 50 years experience of PMMA. The most difficult question is what power of IOL to use. In children over five years, where biometry is available, the IOL that will come closest to emmetropia should be used. If biometry is not available, and there is no information on the previous refractive state of the eye, then the standard power adult IOL (usually 21-22 dioptres) should be used. In children between two and five, it is usual to leave them with 1-2 D (dioptres) of hypermetropia, as this should come close to emmetropia later in life. If no biometry is available, a 23-24 D IOL is used. In children under two there is no clear consensus regarding appropriate IOL power. Correction of aphakia in an infant will probably require a 28-30 D IOL. This is likely to lead to myopia in later life. It is currently recommended that children under two should have an IOL with a 20% under correction. This means that if biometry shows that the child needs a 30 D IOL, a 24 D IOL is inserted. 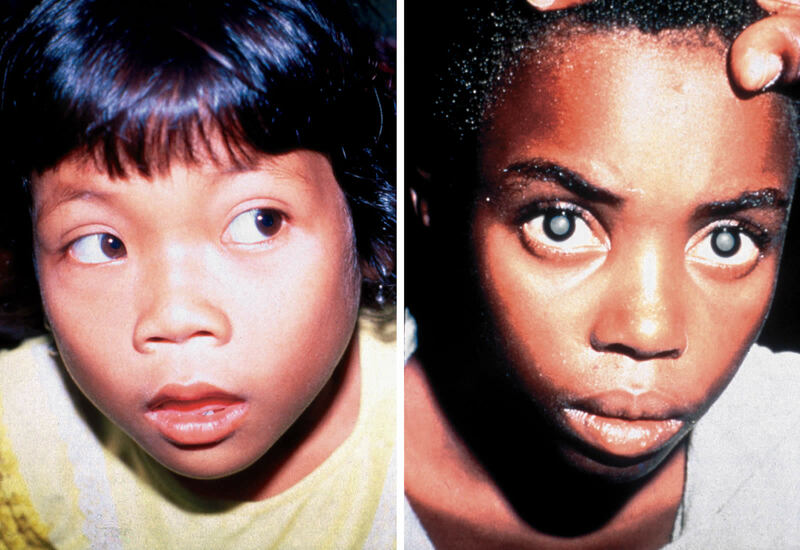 The disadvantage of this is that it leaves the child with significant hypermetropia, which may lead to a blurred retinal image and abnormal visual development. Even with an IOL, children will have no accommodation, and it is important to provide reading correction, or bifocals, for older children. Although multi-focal IOLs are available, there are few reports of their effectiveness in children. IOLs are increasingly regarded as the best treatment for aphakia in all age groups. However, insertion of an IOL into a child can be a difficult procedure, and, if there are serious complications, the vision may be permanently lost. It is possible that good pseudophakia may be better than good aphakia. However, it is absolutely certain that bad pseudophakia is much worse than good aphakia.